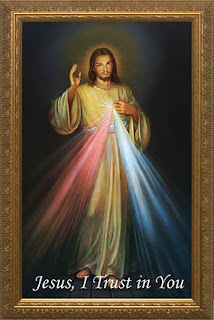 Today is Divine Mercy Sunday. It is the day that the mercy of God shines greatly over those who choose to receive it. Our Lord Jesus appeared to St. Sister Faustina of Polish origin in the 30's. He instructed her about God's mercy and how sin offends God but that sin doesn't have the last say. God is a just God. Many Atheists, Skeptics and others question God's wrath which is highly illustrated through words in the Old Testament. "How can this be a good God?" they cry out in disgust. Well God is good. God has to be just in order for good to have a chance in a world full of evil and sin. If crimes go unpunished, then we will live in an anything goes society which will eventually collapse. This is why we have laws and judicial systems in order to keep the common good afloat. God is no different. The God of the universe is just and does punish when necessary. Moreover, this punishment is no different than a parent disciplining his/her child. We belong to God and He can do whatever He wants with us. However, the Divine Mercy devotion sheds more light into God's justice. God above all is merciful. There is no sin He cannot forgive. There is no evil that is greater than God's mercy. Jesus left St. Faustina a chaplet that we should pray everyday at 3:00 PM if possible. This hour is of course the time Jesus completed His redemptive act on the Cross for all peoples in every time and place. The chaplet is simple and easy to pray with Rosary beads. Today the Church celebrates the Mercy of God. Those who Confessed their sins and receive Holy Communion are granted a plenary indulgence. God is love and wants to forgive us all. Approach His mercy with faith, hope and love and He will forgive you!